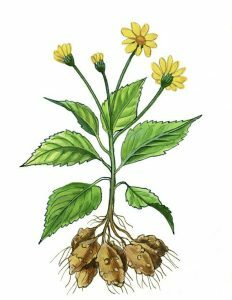 The Jerusalem artichoke (Helianthus tuberosum) is a vegetable that is part of the Asteraceae family. This species is being planted for its underground stems that are rich in nutrients. These contain insulin, sucrose, levulin, protein, mineral salts, etc. This vegetable is also used to feed animals and in the alcohol industry. 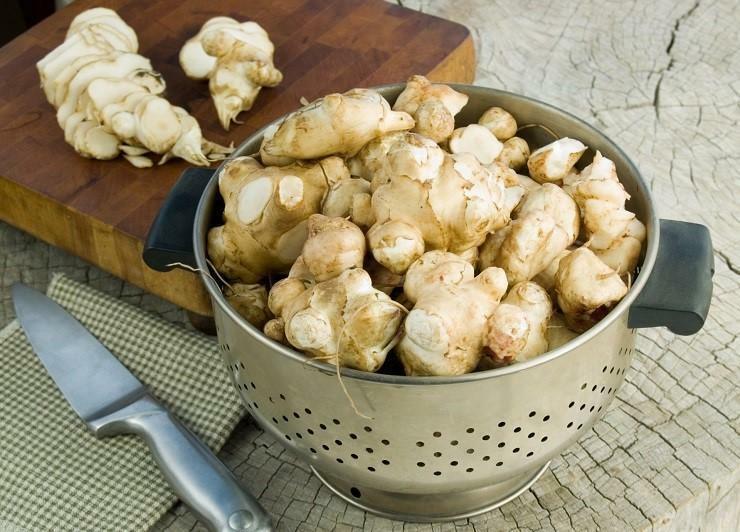 The Jerusalem artichoke supposedly originated from North America, but it was discovered in South-Eastern Canada. This plant is very popular in Central and Western Europe, where it is intensively grown. In all other areas it might be found scarcely planted in people’s own gardens. This is a perennial species that grows underground roots called rhizomes. The root system is well anchored into the soil, reaching lengths of 80-cm. Fibrous roots form on the rhizomes, that are accompanied by the secondary branches which assure the absorption of water and mineral salts. This species can also grow tubercles by thickening the stolons which grow from the stems. The stem can be up to 3-m high, it is coarse and it has many branches. The leaves have different types: the ones from the superior side are oval-lanceolate and the ones from the inferior side are ovate and cordate. The flowers are small and yellow, similar to the sunflowers’. The fruits are 5-6-mm long, gray with dark colored dots. This species is resilient to low temperatures, even the aerial plant parts can withstand temperatures as low as -6 degrees Celsius. During summer, the plant balances its metabolic processes so that it can also withstand the summer heatwave and the short drought periods. It can well exploit the water reserves from the soil’s inferior layers due to its complex and long root system. As any other plant that is planted for its subterranean parts, it prefers loose soils, that have a clay or clay-sandy texture. A 4-year rotation is recommended. 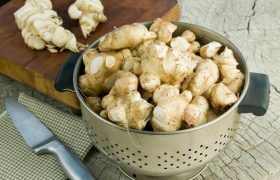 The best predecessor crops for the Jerusalem artichoke are the grasses, grain cereals, clover, alfalfa, annual leguminous plants, corn, cabbage related plants, flax, root plants or bulb plants. 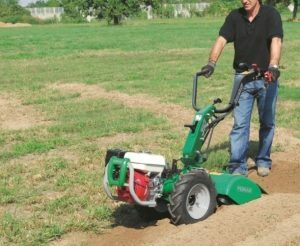 After the previous crop has been dismantled, plow the soil using the disk cultivator as this will destroy the spontaneous plants and the vegetal residues. This needs to be done right away, at a 28-30-cm depth. If the soil is compact or heavy, it can be scarified (as pressing the soil will considerably reduce the production). After plowing and scarifying, the soil needs to be levelled. This operation will positively influence the quality of the upcoming maintenance procedures (planting, applying herbicides, etc.). During spring the soil can have the following herbicides applied: Dual Gold or Roundup. When preparing the soil for planting, it needs to be plowed at a 14-18-cm depth, using the cultivator. Organic compost needs to be applied next, using 20-30 tons per hectare. The best results can be achieved by applying organic and mineral fertilizers. We recommend using healthy planting material, that is disease and pest-free. Use healthy tubercles. These can be planted sectioned or left uncut. The planting process needs to be performed during spring and the following planting scheme must be respected: 80-cm distance between the rows and 50-cm distance between the plants on each row. The planting depth must be 10-15-cm. It is very important to respect the planting scheme because the Jerusalem artichoke’s aerial parts grow a lot in size and need a lot of space. This can be mechanically done, by ploughing the soil 2-3 times. We recommend superficially loosening the soil (5-6-cm depth) and building an anthill around each plant. 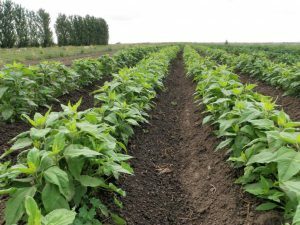 To read information about the diseases and pests that can affect the Jerusalem artichoke crops, please search for the relevant article on our website. This species can last well during dry periods, but in order to have great productions, an irrigation system is mandatory. Depending on the environmental conditions, the crop can be watered 2-3 times using 300-350 cubic meters of water per hectare. Drip irrigation can also be used. This method is more economic, easier to use, it doesn’t affect the plants and it also keeps the soil accessible. The plant’s root system will well exploit the soil’s nutrients reserve and the organic compost that has been applied when preparing the soil. Chemical treatments can also be applied during the vegetation period, such as complex fertilizers (NPK) and leaf fertilizers. During the last autumn days, the aerial stems of the plant need to be shortened to a 30-cm length as this will ease the harvesting process. Harvesting needs to be done manually. The soil needs to be displaced using the hoe and only then can the tubercles be extracted. These will need to be left in the sun for a few days and you can store them. The maximum storing period is 2 months. Due to this, the crop needs to be harvested upon request. This plant can produce around 35 and 40 tons per hectare. After 4-5 years, the plantation will no longer have economic productions, the tubercles will decrease in size. If this is the case, we will recommend dismantling the crop.